Her Lordship Bishop Tina Bawa-Shitgurum is the Apostolic Bishop of the Urban MarketPlace, Nigeria and she use every platform to reach out to students, young adults, women, Men, girls and people living with disabilities amongst us. From the beginning of the year she has hosted and empowers women through the Extraordinary Women Fellowship International an arm of the ministry with the theme “The Deborah Generation”. During this programs and outreaches, she gives free medical care to thousands of people. 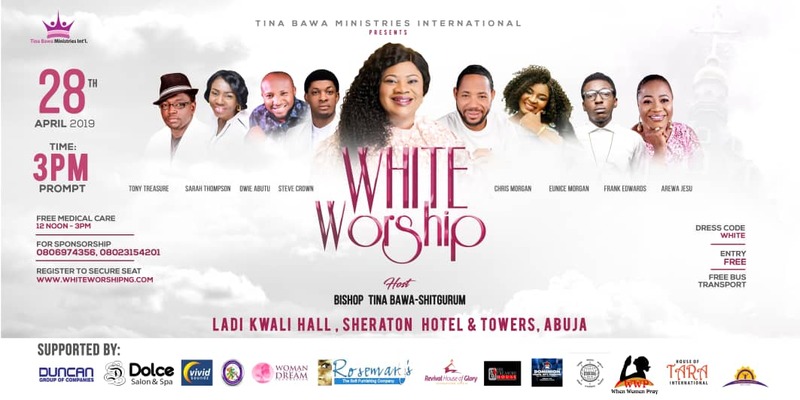 The 2019 edition of White worship will feature an array of great gospel music ministers like Frank Edwards, Chris Morgan, Steve Crown, Arewa Jesu, Sarah Thompson, Tony Treasure, Eunice Morgan, Owie Abutu, Toluwanimee, Chris Ade Emmasings and more.